Fast-track your way to the corner office by applying for a job at a company that invests in its employees. If you’re looking for a career and not just any old job, set your sights on a company that invests in its employees by offering training and development programs. Research shows both companies and employees reap the benefits, including increased job satisfaction levels, internal promotion opportunities and better retention. 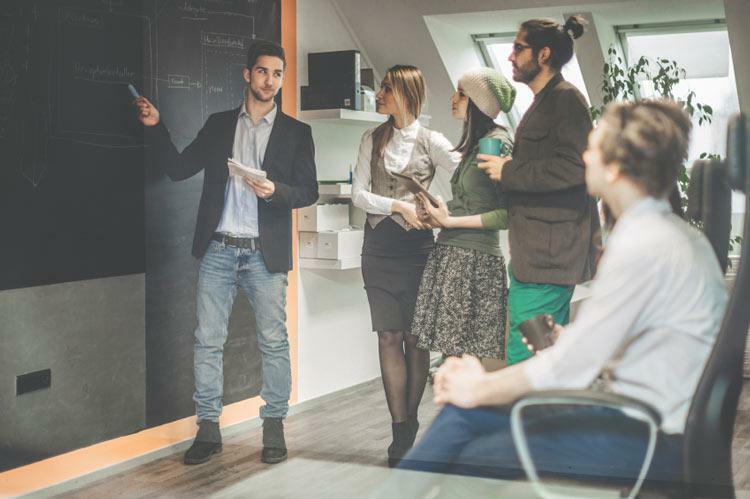 According to a report by Training Magazine, companies in the U.S. spend an average $4.5 billion on training and development programs for employees—so make sure you cash in on this opportunity. Check out these 10 companies offering programs that will help train you to be a better leader, manager and team player. What the company does: Seattle Genetics is a biotechnology company focused on developing antibody-based therapies to treat cancer. Programs offered: Tuition reimbursement, onsite training courses to enhance job-related skills and access to job-related conferences and seminars. “We encourage and support continuing education, offer onsite training to enhance job- and management-related skills and provide opportunities for our employees to attend job-related conferences and seminars,” says Taylor Cline, staffing associate. Why the company offers this perk: “Developing our employees’ careers is an investment for both our employees and the future of Seattle Genetics,” says Cline. Find Seattle Genetics jobs on Monster. What the company does: SAS is a leader in business analytics software and services. Programs offered: Emerging leadership programs for professional training and development, career mentoring and a career resource center. The SAS Academics program for sales and technical enablement provides both in-class and on-the-job training to ensure that recent grads are set up for success before moving into their full-time roles. Find SAS jobs on Monster. What the company does: Amazon.com is an e-commerce company that’s guided by four principles: customer obsession, passion for invention, commitment to operational excellence and long-term thinking. Programs offered: An intensive, month-long training and leadership program prior to hire. Amazon prepays 95% of tuition for employees at fulfillment centers to take courses in in-demand fields. A “Virtual Contact Center” trains employees to work from home. What kind of employee the company is looking for: “We're a company of pioneers. We seek out people who want to make bold bets, take ownership and get their energy from inventing on behalf of customers,” says Pennebaker. Find Amazon jobs on Monster. What the company does: Founded in 2007, Bonobos has established itself as a leader in the retail industry for its innovative approach to launching vertically integrated e-commerce brands. Locations hiring: Locations across the U.S.
Programs offered: “Managing for Success” teaches management skills; “Fit for Success” focuses on performance management training; “How to Manage Up Well” trains associate-level employees to navigate relationships with senior employees; and “Know Your Customer” trains all employees to better understand the customer experience. Why the company offers this perk: “The goal is to help our employees become better workers and to equip them with the skills they need to manage themselves and their teams,” says Tiff Poppa, senior manager of employee experience. Find Bonobos jobs on Monster. What the company does: AT&T helps millions around the globe connect with entertainment, mobile, high-speed Internet and voice services. Programs offered: AT&T University is an executive-led program focused on leadership and management development housed at their Dallas headquarters, with satellite campuses across the U.S. In partnership with Georgia Tech and Udacity, Inc., AT&T helped create the first-ever Online Master of Science in Computer Science (OMS CS) degree and partnered with Udacity to create and launch several self-paced, fast-track technical credentials called Nanodegrees across web and mobile development, data analytics and tech entrepreneurship, with more programs to come. Find AT&T jobs on Monster. What the company does: Randstad US is one of the largest staffing organizations in the U.S., providing temporary-to-hire and permanent placement services each week to more than 100,000 people through its network of more than 900 branches and client-dedicated locations. Programs offered: Training programs in the areas of certification, new manager skills, manager effectiveness, leadership development, communication and presentation skills, plus mentoring and coaching programs. What kind of employee the company is looking for: “Job seekers with a strong drive to succeed, strong judgment and strong work ethic,” says Prince. Find Randstad jobs on Monster. What the company does: Paychex is a leading provider of integrated human capital management solutions for payroll, HR, retirement and insurance services. Locations hiring: Rochester, New York; Greensboro, North Carolina; Phoenix; Nashville; Oklahoma City; Denver; Indianapolis; Hartford, Connecticut; Middletown, Ohio; Miami; and St. Petersburg, Florida. Programs offered: Customized new-hire training programs for sales and service employees. The new-hire programs are a combination of virtual learning at an employee’s home base and instructor-led learning at a state-of-the-art training facility in Rochester, New York. Find Paychex jobs on Monster. What the company does: CyberCoders, a division of On Assignment, is a tech-focused permanent placement organization. Programs offered: Through the Associate Recruiter Incubator Program, CyberCoders takes educated, highly driven, competitive individuals and teaches them to apply technology to a diverse marketplace. What kind of employee the company is looking for: “Individuals who want to be part of a positive and hardworking team,” says Lamb. Find CyberCoders jobs on Monster. What the company does: Schneider Electric is a global specialist in energy management and automation. Programs offered: Schneider Electric University offers dedicated academies for executive development, leadership, customer education, energy and solutions, sales excellence and functional skills. The company also offers Energy University, a free online educational resource with more than 200 courses on energy efficiency and data center topics. What kind of employee the company is looking for: “We are looking for people to embrace our high-performance culture by being straightforward, open, passionate and effective and to challenge the status quo,” says Roland. Find Schneider Electric jobs on Monster. What the company does: Marriott International is a leading hotel and lodging company, with more than 4,400 properties in 85 countries and territories. Locations hiring: All hotel and headquarter properties are hiring. Number of employees: There are more than 200,000 employees at Marriott-managed properties, including 102,301 employees in the U.S.
Programs offered: Marriott International offers a variety of training to employees worldwide using multiple training delivery methods, including virtual and in-person. The training focuses on developing skills, and provides professional and career development training. Topic areas include work-life balance, leadership and management. Why the company offers this perk: “Marriott International offers our associates training because we believe in the well-being and growth of each and every one,” says Arne Sorenson, President and CEO, Marriott International. Find Marriott jobs on Monster. It's critical to work for a company that's invested in your development. When you look good, they look good. Are you looking for an employer you can really grow with, but aren't sure where to begin? Join Monster for free today. As a member, you'll get career advice and industry insights sent directly to your inbox so you can keep up with which companies are doing the most for their employees. And then you can go join them.